Stop by the Hearst Museum’s courtyard to experience experimental archaeology in action. Graduate student Joshua Varkel will be experimenting with thatched hut construction techniques to give insight into daily life in ancient Jordan. 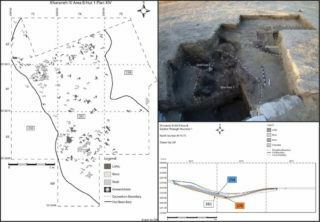 Since 2008 the large aggregation site of Kharaneh IV has been excavated by Dr. Lisa Maher and colleagues. Located in the previously wetland environment of Eastern Jordan, Kharaneh IV is extremely rich in artifacts, containing millions of stone tools and faunal remains, as well as thousands of shell beads transported from hundreds of kilometers away. 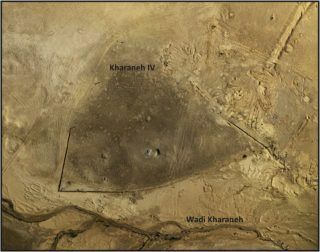 The burnt remains of three hut structures have been uncovered, and the oldest human burial ever found in Jordan was located within one of these burnt structures. Kharaneh IV is unprecedented in not only size and complexity, but also in terms of sedentary practices. Understanding how these early huts effected the living spaces of these prehistoric people is critical to interpreting daily life of its inhabitants as well as how and why Kharaneh IV was thousands of years more socially advanced than previously thought. In the summers of 2018 and 2019, we hope to experimentally reconstruct thatched huts in Jordan near the archaeological site of Kharaneh IV, using traditional stone tool technology, and then burn it down similar to what was done 20,000 years ago. Following this, we will analyze the burnt remains and compare it to the archaeological record, and then repeat this building, burning, and analyzing process until an accurate replication has been made. By burning it down, burying the remains, and excavating the structure, we hope to gain a better understanding of the form, function, and use of space at the campsite, and create a comparative analog so that we can better interpret what we excavate from Kharaneh IV and other relevant sites. Additionally, we will conduct use-wear analysis of the chipped stone tools used in the construction so that we will be better able to identify the function of similar artifacts found during excavation. With an accurately reconstructed hut, we will replicate activities that we think the inhabitants of Kharaneh IV would have done. These activities include flint knapping (stone tool production), hide processing, animal butchering, and shell bead manufacturing. 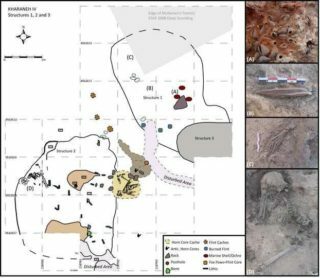 This can give insight into site activities and social organization, providing researchers a glimpse of the social culture of these 20,000 year old inhabitants. With space provided by the Phoebe A. Hearst Museum, we will practice rebuilding the hut structure. The main focus will be on techniques used in construction, rather than exactly replicating the hut. Experimentation of grass thatching, frame construction, cord making, and general assembly will be done in the courtyard throughout this and future semesters. 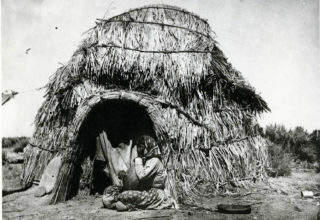 Recent research has suggested that the Kharaneh IV huts would have most resembled the Tule houses of the western United States. During the process of construction, we hope to engage with Native American groups to learn about their construction methods and about the broader significance of their house structures. Plan drawings of Area B Hut structures.